3. Add the eggs, bananas and vanilla (plus applesauce if using) and beat well. 4. In a separate bowl, mix together the flour, baking soda and salt (plus wheat germ if using). 5. Stir the liquid ingredients into the dry ingredients. At this point, add the chopped nuts if using. 6. Pour this mixture into a greased, 9×5-inch loaf pan and bake for 60 minutes. Let cool in pan for 10 minutes then take it out and let cool on wire rack. « My Oven is Fixed, My Sister is Here, New Books! I have that cookbook, and have been to the store in Vermont. Neat place, and lots of cooking gadgets. Delicious! I added a little flaxseed and some chocolate chips instead of nuts. Very nice. I think the sugar could be decreased a little without hurting the results, but it's delicious as is. 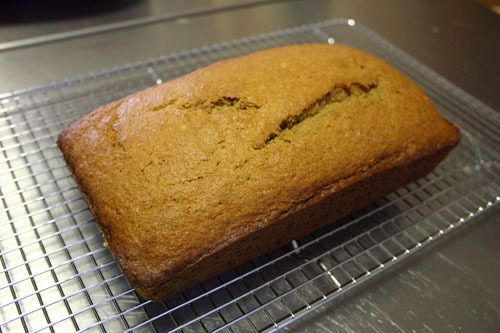 I have been looking for a good whole wheat banana bread recipe for awhile. I love this one! I added a little flaxseed and no nuts and it is still delicious. This recipe is so wonderful. I cut the sugar to 2/3 cup, added 12 cup of ground flaxseed meal and a half cup of applesauce. I also skipped the nuts (allergies) and added chocolate chips to the mix. They were so moist and so nutritious!! And, my son's third grade class loved them!!! oops - That is 1/2 cup of ground flaxseed ! !And, they were made into muffins for the kids!! this recipe was a pleasant surprise...i was a bit skeptical if it would actually taste good... not only did it taste good, but is probably the best banana bread recipe ever - this is my opinion and the opinion of my roommates and coworkers :) i made it just as it says here using 3 big bananas (love the taste of banana!) and landolakes spreadable butter with canola oil. I've used a very similar recipe to sneak more whole grains into the kids diet. I decreased the sugar to 1/2 cup & used white whole wheat flour (king arthur) and added 3T ground flax. They gobble it down every time...so do I! Thanks for the post. Can you convert this to a bread machine recipe??? I have arthritis and cannot use my hands to knead the bread, so I have to use the machine. Would love to make this for my family. I've been looking for a healthier banana bread so I decided to try this tonight. It's amazing. I added the applesauce and wheat germ too. I only added 2 bananas but I think it could have used one more. I also baked it in a 8x8 dish instead of the loaf pan and only had to bake it for about 45 mins. Thanks for the great recipe!! I've been searching good information about this matter for some time and I gotta say you publish gives me some general concept about my paper I'm gonna write for my assignment. I would love copy a few of your words right here and I hope you don't mind. Thanks. I'll reference your work of course. Thank you.Hold updating the good posts. will come back. I was Blown Away by this recipe!! The flour makes a fantastic texture and density. I used coconut oil, which worked really quite well, and brown sugar as I cannot fathom making BB with white *L* I plan on trying coconut palm sugar next time. Sooooooo Tasty!